IOA / Professor / Dipl.Ing. Dr.techn. 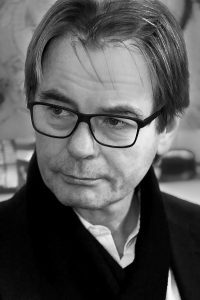 Klaus Bollinger has studied Civil Engineering at the Technical University Darmstadt and taught at Dortmund University. Since 1994 he has been assigned Professor for Structural Engineering at the School of Architecture/University of Applied Arts at Vienna and since 2000 guest professor at the Städelschule in Frankfurt. In 1983 Klaus Bollinger and Manfred Grohmann established the practice Bollinger + Grohmann, now located in Frankfurt am Main, Vienna, Paris, Oslo and Melbourne with around 100 employees. The office provides a complete range of structural design services for clients and projects worldwide. For years they have been collaborating successfully with numerous internationally recognised architects and strive to always provide the best solution through their creativity and technical excellence. Their scope of work includes building structures, facade design and building performance for commercial, retail and exhibition facilities as well as classic civil engineering structures such as bridges, roofs and towers.